Last week, while going through some old files, I came across earlier versions of the manuscript that became my new book of poems, FALLOW FIELD. There were copies of the manuscript with thoughtful edits and suggestions in the margins and on the pages by poetry mentors like Alison Hawthorne Deming and Colette Inez, as well as peers and colleagues like Thomas V Hartman (we were editors together at Painted Bride Quarterly before launching Ducky Magazine in 2000). I was reminded that we poets don’t work in a vacuum, we work in a community. And I was further reminded that such community isn’t always easy to find. I was lucky to find a community of poets in my own way. I don’t teach in a university or writing program, so I’ve always been something of an outsider in the poetry world. I had to actively seek out other poets and poetry enthusiasts. Readings, workshops, and open mics helped in the early years or when I moved to new cities. My work as an editor at Viking Press/Penguin Books put me in contact with a number of poets, as did my volunteering to coordinate the Series at Ceres Gallery in New York in the early 1990s, which paired established and emerging poets who I invited to read together. Then there were the events and good people at Poets House, first in the Spring Street location and later in Battery Park City, which also gave me exposure to poets, some of whom became good friends over the years. 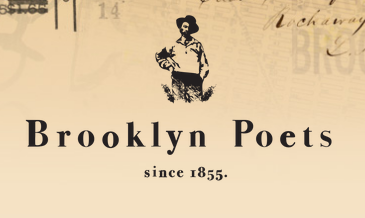 “The Bridge” from Brooklyn Poets will be a community for poets to share, collaborate, and learn from each other. But what of those poets who aren’t so fortunate to come into contact with other poets through their work? Where do they turn for mentorship, camaraderie, constructive criticism, and other support? It can be a daunting prospect. And what about those poets who want to give back in some way, to help encourage the next generation of poets, to “pay it forward,” as they say. That’s why I think “The Bridge,” a project of Brooklyn Poets is such a good idea. 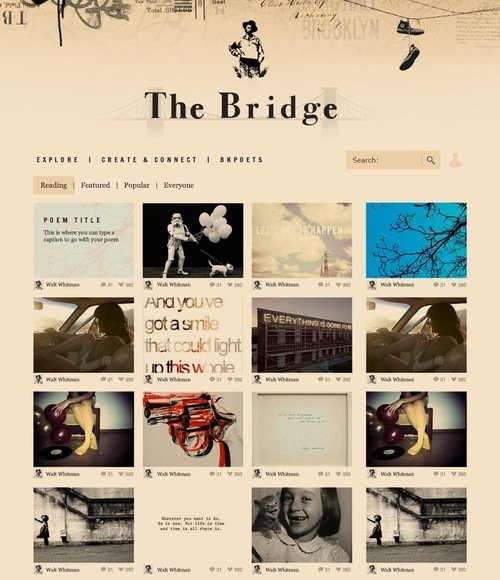 It’s more than just a social network, The Bridge will, as the name implies, be a bridge between poets far and wide, young and old, scholar and autodidact, established and emerging, new and, well, you get the picture. As Brooklyn Poets puts it: “Too many student & mentor poets today are missing each other. We have this thing called the internet to connect them, but no network getting it done. Help student poets find mentor poets to get critiques of their work without having to go through a workshop structure or writing program. Help mentor poets find student poets by offering critiquing services — at their own prices. Students find mentors for less money than a workshop or writing program would cost, and mentors get paid without having to land one of those hard-to-find teaching jobs. It’s that simple. Students choose mentors based on price, services offered, location and other factors such as skills and stylistic influences. If they like, they can sign up for workshops proposed by mentors–workshops not governed by the mandates of any institution, for however long mentors want, with however many students, at whatever price, online or on site. You’ll have Readers, not Followers. You’ll create new work. Each week on The Bridge we’ll feature a poetry assignment proposed by a mentor in our community. Sharing your work will be a creative process. You can choose images to represent your poems and captions to go with them—like book covers for your individual poems. Add tags so readers can find your poems based on similar interests. Sounds great, right? So join me in supporting and joining “The Bridge,” take a look at their Indiegogo campaign and help build The Bridge!